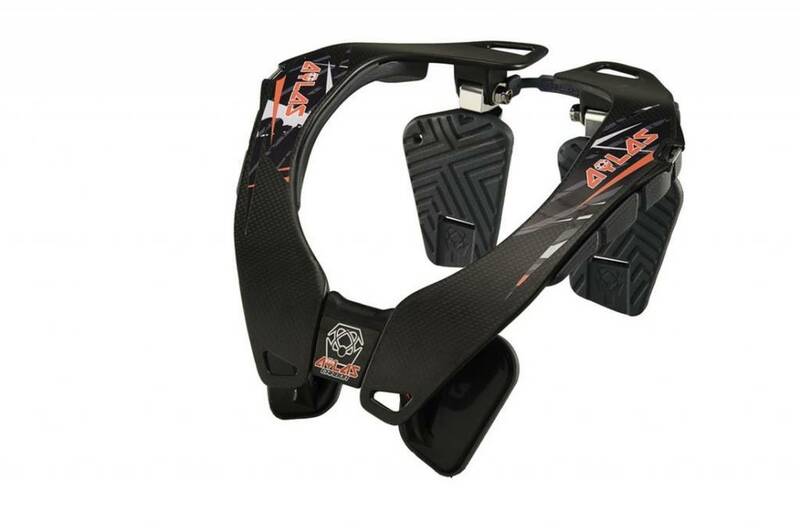 The Atlas Crank Carbon neck brace has been designed for use in BMX, Mountain and Downhill. The Atlas Crank is based off of the original Atlas Brace. The Crank has been revamped for the needs of cyclists. The Atlas crank has 3 different height options, 4 possible back support options, 2 possible strap options, and 2 strap systems. All these possible options and features make the Atlas Crank super versatile in its fitment. This fitment produces a near tailor fit for almost any rider. The Atlas crank features ERS. ERS stands for Emergency Release System. The ERS is able to provide an easy removal in case of a severe crash. This is very important when time is of the essence. The Atlas Brace is also the first non-rigid brace. Atlas has created a simplified design. This allows for the frame to flex up and down in the rear, this maximizes comfort and minimizes the “trapped” and bulky feeling. All hardware is made from lightweight and durable 6061 T6 aluminum. The Atlas Crank is perfect for any rider looking for a brace that is versatile in its fitment and safe in its construction. The Atlas Crank has been designed with cyclists in mind; this tailored design adds security and comfort whenever you put this brace on. Design by riders for riders even more reinforces this feeling.